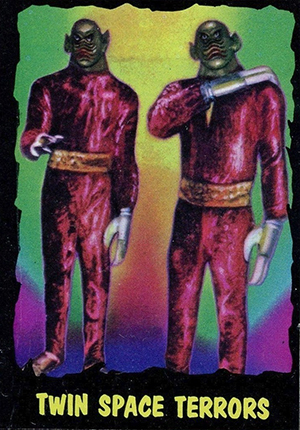 Although it's reviled by some for it's liberal spin on a beloved Sci-fi property, 1964 Topps Monsters from Outer Limits is still one of the most popular entertainment trading card sets of all-time. Highlighted by strange creatures, the set also features notoriously tough black borders that make finding top-condition cards extremely tough to find. While Topps produced the Outer Limits set, it was released under the Bubbles Inc. banner. The same thing happened with 1962 Topps Mars Attacks, presumably to put a little distance between the company and the potentially controversial subject matter. The Outer Limits ranks near the top of the list when it comes to beloved Sci-fi TV shows. But there's some mixed feelings about the set from big-time fans. The cards may use visuals from the series, but the write-ups have nothing to do with it. According to this interview with Len Brown, one of the set's creators, when the show's writers wanted money for using their storylines, Topps didn't have the budget and did their own. 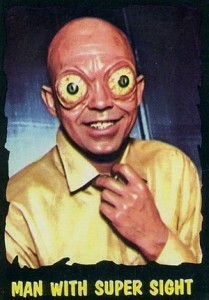 Besides the subject matter, another reason why 1964 Topps Monsters from Outer Limits is so popular today is the design. Card fronts have a black border that is extremely condition sensitive. They amplify even the smallest dings. Images are taken from black and white promo stills that were colorized by Topps. Card bottoms have a yellow caption. Card backs are primarily black. A yellow comet shoots across with the top. The caption is repeated in a headline. The text is in a large yellow box. Further adding to the challenge of building the set are a few double prints and a ton of perceived short prints. Nearly half of the set is tougher to find while other cards are much more readily available. 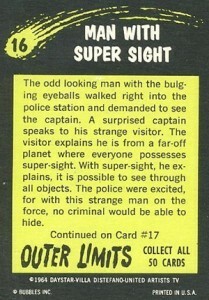 5 Man from Galaxy "X"
37 "You Can't Stop Me"
1964 MAN WITH THE SUPER SIGHT OUTER LIMITS # 16 SGC 60 ! !